Written expression is a huge part of life inside and outside the classroom. 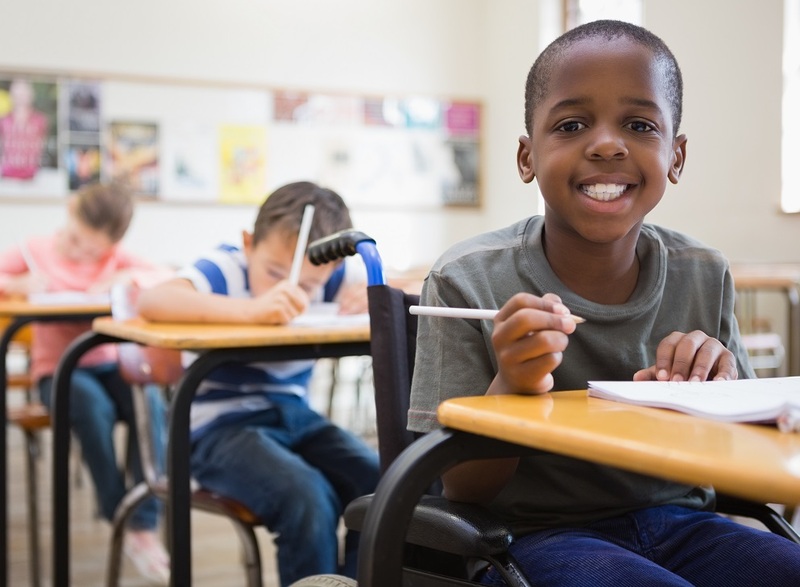 When students with disabilities learn to write, type, and/or select appropriate communicative responses, it opens the door to greater opportunities to reach their learning goals, communicate their preferences, and establish rapport with the people around them. Today’s post shares 7 important steps to consider when designing programs for teaching written expression to students with disabilities. 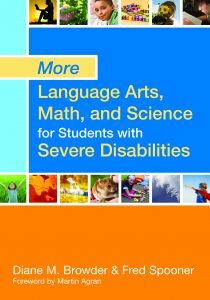 These are excerpted and adapted from the excellent guidebook More Language Arts, Math, and Science for Students with Severe Disabilities, edited by Diane M. Browder and Fred Spooner. To help you easily determine instruction objectives, you might also use a curriculum-based assessment tool that uncovers information about a broad array of skills relevant to writing–such as a student’s fine motor skills, communication, visual discrimination, and imitation. 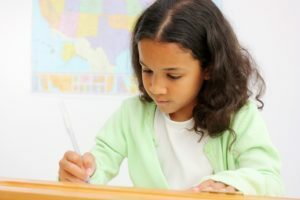 Focusing on the mechanics of writing will often prevent a student from understanding and accomplishing the purpose of writing. Think beyond the traditional ways students have learned to write, and focus on making writing meaningful. Ask what’s important and potentially reinforcing to students, and use the answers as engaging topics for written narratives. Try presenting pictures of characters from a book and asking the student, “Whom would you like to write about?” Let the student select their three most preferred characters to focus on during writing instruction. Teach students to request desired objects by exchanging pre-written words for preferred items. For example, you might instruct a student to get a cookie by handing the written word cookie to a partner. Once the student masters this, he or she can be taught to combine the written words big and cookie to communicate a desire for a larger cookie. This is a powerful way to give students direct control over their environment as they learn the functional use of written words. As a bonus, it allows students to use pre-written words without having to learn more complex fine motor and cognitive skills first. Deliver reinforcement right away. 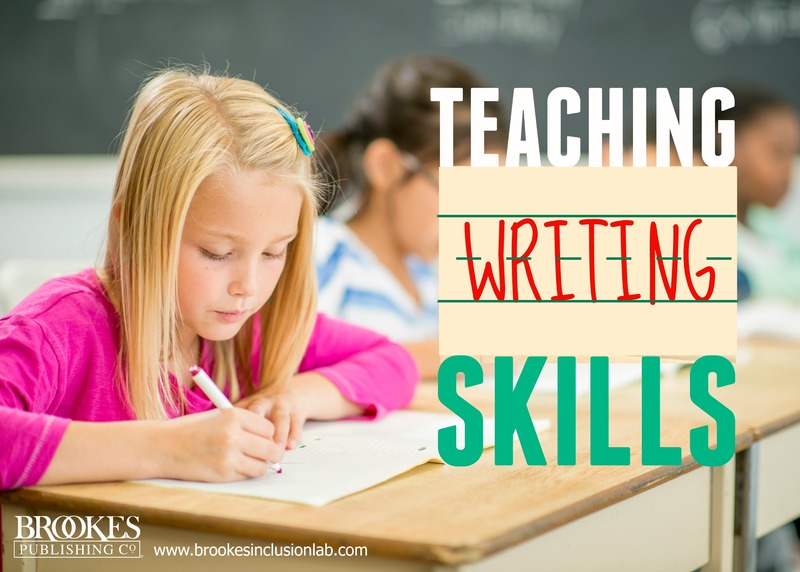 When your student displays any type of writing or prewriting behavior–holding a crayon, scribbling, pressing keys on a computer, drawing on a SMART Board–follow it up with immediate praise and reinforcement. This will hopefully increase the frequency of their writing behavior and improve the fine motor skills they need for handwriting or keyboarding. Teach students how to copy words from labels, books, and other sources. Provide lists of words your students can copy from to increase their engagement in academics and leisure activities. For example, you can provide a list of words students can copy into search engines to access educational content for school (solar system, dinosaurs, U.S. presidents, etc.) and locate information on hobbies (computer games, stamps, scrapbooking). Once you teach students this skill, they can also use the print within their environment to develop their spelling proficiency. A student who can’t remember how to spell the word “milk,” for instance, can consult a milk carton for a model of the word. 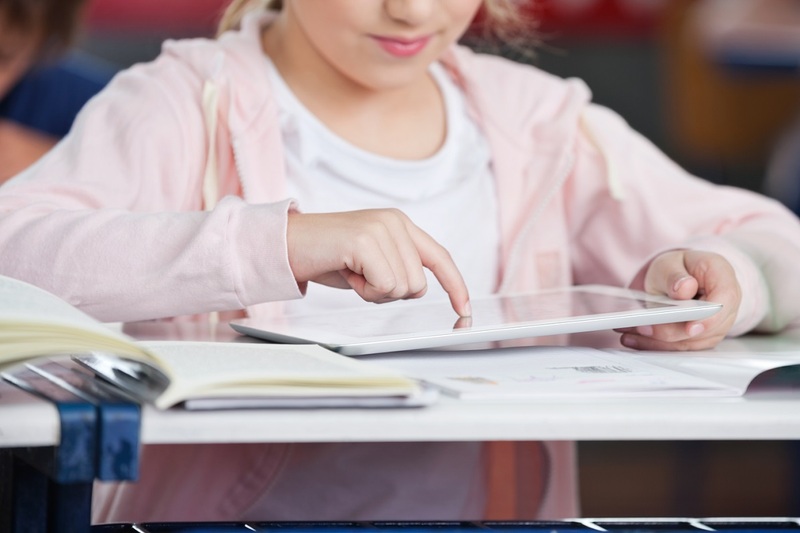 When learning to copy words, some students may need assistive technology to circumvent weaknesses in fine motor skills. 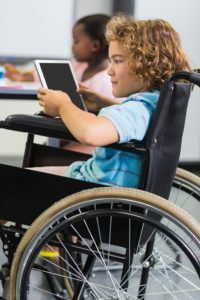 You may need to use adapted keyboards (alphabetical, onehanded, large print), AAC selection displays, and/or scanning technology for students who have physical disabilities that affect their gross and fine motor functioning. Backward chaining strategy. Present the spoken word and then provide a written model for the student to trace. Fade the written model by incrementally removing the letters in the word from the last letter to the first. Computer-assisted instruction. Show the student a word/picture combination, and then ask him to select letters from a computer-based array to construct the word shown. Cover, copy, compare (CCC) technique. Give the student a piece of paper divided into four columns. The first column contains the targeted spelling word. The student copies the word and writes it in the second column. Then the student folds the first column on the left toward the center (covering the second column) and writes the word from memory in the third column. The student unfolds the paper and compares, and if she’s made an error, she copies the word three times in the final column. Begin instruction by teaching students to write, type, or select words when presented with a picture or object. Once students have acquired a small word-to-picture repertoire of about 50 words, start using sentence starters (“I see a _____,” “The boy is ______”) to expand the length of these responses. Fade the sentence starters gradually so that students are independently constructing sentences. Once students can write a single sentence about a picture, encourage them to write multiple sentences about a picture. Present pictures containing a variety of stimuli and highlight features of the picture to help students identify content in which to describe or label. These prompts can then be faded to ensure students can choose to write about the stimuli that they deem important. Fade the use of pictures so that students can eventually write about things they have learned. Slowly increase the amount of time between the observation of the picture and the writing response. This fading is important, since students will rarely be asked to write about things immediately present in their environment. Note: If students have not acquired sufficient spelling skills to write sentences, then they may require the use of selection-based writing software in which words or combinations of words are presented within arrays on a computer screen. Begin by teaching students to write simple paragraphs. Show them that a paragraph names a topic and then tells more about that topic. Teach students to apply this rule when writing a paragraph about a picture. Help the student to identify the content of a topic sentence by highlighting a key element within the picture. Present a visual organizer and show the student how to use it during planning and while writing his or her paragraphs. To give students a model for simple storytelling, show them a series of pictured events or video recordings of real-life events (e.g., child plays ball, child falls down, child cries). You might also give students a series of pictures to sequence themselves before they write a story. Once students can write or construct a paragraph about a picture or other visual aid, fade the use of visual supports. 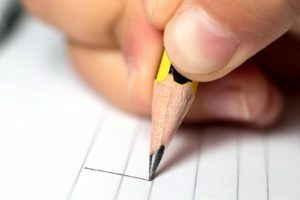 After teaching a student to write simple sentences, instruct the student to identify whether he or she has included both a person or a thing and something more about the subject. Direct the student to look for ending punctuation. Ask students to identify missing elements in their stories. Have them practice by presenting a variety of examples and having the student record the presence or absence of the elements. Teach students to use checklists to increase the inclusion of critical elements during writing activities. Show students how to graph their use of writing elements and monitor their own progress, so they can become more independent and effective writers. Writing instruction for students with disabilities is a complex process that must be carefully and deliberately planned. These were just a few suggestions to get you started. For more guidance–and practical information on how to teach other academic content areas to students with developmental disabilities–check out More Language Arts, Math, and Science for Students with Severe Disabilities. Hi! You can find our complete list of books related to teaching children with learning disabilities here: https://products.brookespublishing.com/Learning-Disabilities-C1059.aspx. Many of these have sections on teaching literacy skills, including writing, to students with learning difficulties.